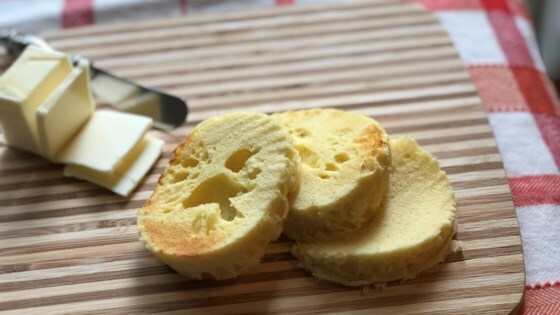 "Try this quick and easy keto and paleo bread made with only 5 ingredients in the microwave in just 90 seconds! So tasty and just perfect for sandwiches and toast." Place butter in a microwave-safe mug. Microwave until melted, about 15 seconds. Swirl mug until fully coated. Combine almond flour, egg, baking powder, and salt in the mug; whisk until smooth. Microwave at maximum power until set, about 90 seconds. Let cool for 2 minutes before slicing. Chef John's keto replacement for bread is gluten-free, too. It’s very good. Very bread like. Nice texture. Firm enough to make a sandwich. Flavour is nice and mild. Good bread substitute for low carb and wheat free people. Will definitely make again! This was really good, and super easy too! The texture was almost exactly like regular bread. I added a tiny bit of xanthan gum and it was sturdy enough to make thin slices. Thanks for the recipe! Very impressed! Popped right out of mug after microwaving. I added a 1/2 tsp of swerve and a dash of cinnamon for more of a French toast flavor. It tasted delicious. Definitely a go to recipe. Very easy, but I agree with other reviews. It works well being toasted. The bread is spongy and gives you that "full" feeling. I may try to add a little coconut flour.